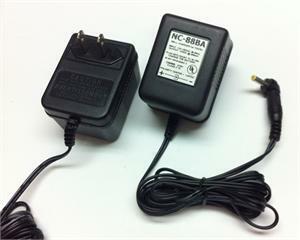 NC-88BA : Wall Charger for Yaesu, Vertex, Standard Horizon radios. Replaces original NC-88B. Plugs into 110-120VAC wall outlet. Output is 12VDC @ 200mA. Plugs into radio or slow-charging cradle. Fits the following radios: Yaesu-Vertex FT-60R/E; FT-10R, FT-40R, FT-50R, VX-110, VX-120, VX-127, VX-150, VX-160, VX-170, VX-177, VX-180, VX-177, VX-180, VX-210A, VX-250, FT-270, FT-270R, VX-400, VX-800; VXA-100 (Aviator Pilot), VXA-120 (Aviator Pro II), VXA-150 (Aviator Pro V), VXA-200 (Aviator Pilot II), VXA-210, VXA-210 LITE, VXA-220 (Aviator Pro VI), VXA-300 (Aviator Pilot III), VXA-300 Lite ; STANDARD-HORIZON HX270S, HX370S, HX500S, HX600S, and many more Yaesu, Vertex, & Standard Horizon radios & cradles. Pricing is for 1 charger. Picture shows 2 sides of the wall charger. E-DC-5BA : DC Power & Charge cord for Yaesu, Vertex, & Standard Horizon radios.Fits models such as FT-70D, FT-65D, VX-8R, VX-8RE, FT1D, FT1DR, VXA700, VX7R/Rb, VX6R, VX5R/5Rs, VX120, VXA150, VX170, VX177, VX180, VX210, VX250, VX270, VX277, FT817, & more ! FNB-83x: 7.2 volt 2000mAh rechargeable Ni-MH battery for Yaesu and Vertex radios: FT-60R, FTA-230, FTA-310; VX-110,120,127,130,150,160,170,177,180,210A,250,270,400,410,420,800; VXA-150 Pro V, VXA-210, VXA-220 PRO VI; HX270s, 370s, 500s, 600s etc. FNB-V57x : 7.2 volt 2000mAh rechargeable LONG LIFE NiMH battery for YAESU & VERTEX radios. FNB-V57x: 7.2 volt 2000mAh Long-life rechargeable NiMH battery for Yaesu, Vertex, and Standard Horizon radios. Replaces FNB-64, FNB-V57, FNB-83, FNB-V94 etc. 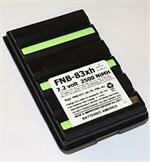 FNB-83xh : 7.2 volt 2500mAh LONG LIFE rechargeable Ni-MH battery for Yaesu & Vertex radios. Fits VX-110, 120, 127, 130, 150, 160, 170, 177, 180, 210A, 400, 410, 420, 800; VXA-150 Pro V, VXA-200, VXA-210, VXA-220 (ProVI), VXA-300 (Pilot III), FT-60R, etc.